Things you Can’t miss in Dunedin! 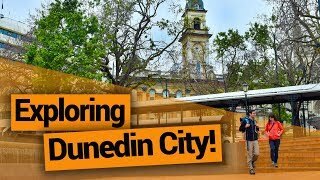 With a mix of grand historic architecture and nature experiences, it’s fair to say that Dunedin is a unique city. There’s so much to do in this Otago city, both in the city with its wealth of museums and literally just outside the city with the Otago Peninsula being a wildlife haven. How do you choose what to do?! Well, that’s where this awesome list of Dunedin must-dos comes in! 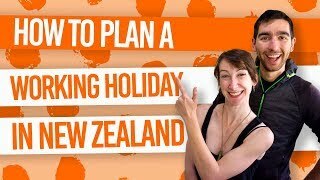 With limited time and budget, it’s important to be choosy when deciding which activities to do in Dunedin. We’ve put together this list of must-dos in Dunedin to narrow down the offerings. 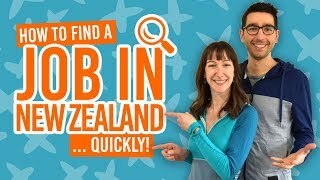 However, if you do have more time, be sure to check out some of these 17 Free or Cheap Things to do in Dunedin or even 11 Things to Do in Dunedin on a Rainy Day if the weather is not on your side. The Otago Peninsula is a haven for wildlife, provides amazing views and is one of the best places in New Zealand to see the Southern Lights. It’s well worth taking a road trip or hiring a bike to explore the bays and inlets of the Otago Peninsula. 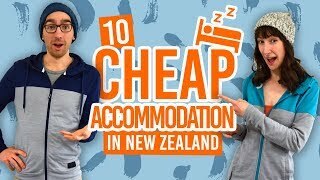 Find out more in our Dunedin – Guide For Backpackers. Location: The Otago Peninsula is accessed Dunedin via Portobello Road. 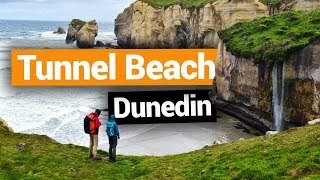 One of New Zealand’s most stunning natural coastal features can be accessed just a short drive of public bus journey away from Dunedin city centre. See arches carved by waves and access the beach at low tide via a manmade tunnel through the cliffs. What’s more, there are plenty of picture opportunities for waterfalls! Location: 8km from Dunedin city centre. Tunnel Beach is on Blackhead Road in South Dunedin. Catch a local bus to Corstorphine on route 32, 33, 34, 35 or 36. From the corner of Middleton Road and Stenhope Crescent it is approximately 30 minutes walk to the start of the track. Dunedin is a mountain biking mecca, from easy rides on the Otago Peninsula or in the surrounding hills to dedicated downhill mountain biking trails, there are bike trails in Dunedin to suit all abilities. What’s more, taking the train from Dunedin to Middlemarch is a fantastic way to start the famous Otago Central Rail Trail a 151km multi-day excursion through the Otago region. Find out more in our guide to Mountain Biking in Dunedin. Dunedin is an amazing place to see New Zealand wildlife. There are several options to get close-up viewings of fascinating birds and marine mammals. 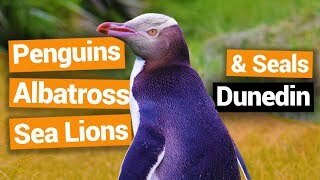 Visit Orokonui Ecosanctuary, Penguin Place and The Royal Albatross Centre. Or join Elm Wildlife Tours for penguin, sea lion and seal spotting! Dunedin’s museums are well worth checking out, especially the Otago Museum. Learn about the natural and social history of New Zealand, the Otago region, Dunedin and the rest of the world through fascinating displays and artifacts. They’ve even managed to squeeze in a Planetarium and a tropical butterfly garden! Either enjoy the free exhibitions or jump on a guided tour to make the most of your visit. Location: 419 Great King Street. Another fantastic museum in Dunedin is the Toitu Otago Settlers Museum. Journey through the history of Dunedin’s first human arrivals to present day locals in this museum full of super interesting exhibitions. Step into old Maori villages, inside emigration vessels and even Dunedin’s old public buses in this interactive museum. Dunedin’s most iconic building, the Dunedin Railway Station, is the start of your journey through the isolated farming communities of the Taieri Gorge Railway. See stunning views of the dramatic river gorge on this historic journey taking you through tunnel after tunnel and viaduct after viaduct. Book your Taieri Gorge Railway ticket with Dunedin Railways. Location: The Dunedin Railway Station is just off Anzac Avenue. New Zealand’s only castle is right here in Dunedin on the Otago Peninsula. There are several ways to enjoy this grand historic building and its gardens with self-guided tours, guided tours and high tea in the Ballroom. Location: 13km from Dunedin city centre. Take Highcliff Road on the Otago Peninsula then onto Camp Road where the castle is signposted. Go sailing or wildlife cruising from the Dunedin Harbour! Wildlife cruises, such as Port to Port, will take you alongside the Otago Peninsula to see a wealth of seabirds, seals and sea lions, while dolphin cruises will take you further out in search of the ocean’s cutest and most playful marine mammals. Otherwise, there are sailing charters to sit back, relax and enjoy the ocean. Dunedin is the home of New Zealand’s most popular beer brand, Speight’s. Join them on a tour of the brewery where tastings are compulsory!